Winter, summer, whatever the season this Cotton Crew sock can weather it all. With a dual layer cotton inner and nylon outer for durability, it offers a cushioned foot for reducing impact and comfort. 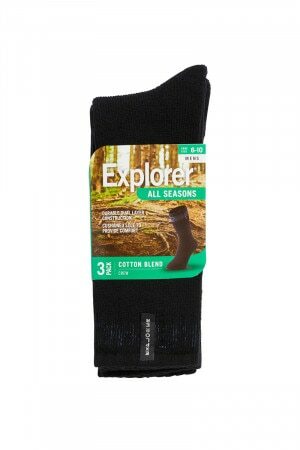 Explorer All Seasons Cotton Crew 3 Pack is rated 3.4 out of 5 by 5. Rated 1 out of 5 by Mummys Boy from Why are there 3 different colour bands on the socks? The reason I bought 2 packs of these is so I would have all the same colour socks for the week and would not need to go searching for a pair. There is no logical reason to make the 3 pairs ever so slightly different! The photo on your site does appear to show all black socks in the 3 pack? Now my poor mum has to go hunting through the clothes basket to make pairs. She is not very happy with you lot!! Rated 5 out of 5 by Jimmy96 from Unbelievable comfort. Title says it all, comfort is amazing. I work in retail so I'm always on my feet. These socks are incredible. Rated 1 out of 5 by Molly Bean from Really disappointed - long time bonds customer but my husband has managed to put holes in these within the first couple of wears & he wasn't doing anything out of the ordinary.